Denis Timofeev has won his first WSOP gold bracelet in Event #73: $1,000 Double Stack Turbo after besting a field of 1,221 players. Timofeev beat experienced Spanish pro Leo Margets heads-up to secure the $199,586 payday in a swingy see-saw heads-up battle which saw the chip lead change hands with a series of all-in showdowns. "I don't understand what's happened!" said Timofeev, "I like to play Turbos and Hypers online, and it's good in live tournaments too because you don't need to play for a lot of days to win the big money. I just played my game, sometimes I was very lucky." With two tables left, Timofeev got very lucky indeed, moving all in with queen-ten suited against pocket queens, only for Timofeev to flop the nut straight. "The tournament is fast and it's difficult to make huge mistakes," said Timofeev with a smile. "Of course sometimes you shove queen-ten into queens, but it's OK if you know some maths. "This WSOP has been no good for me. This is only my second ITM. My first was for $600 in The GIANT, so this is a nice comeback to finish off the Series!" With 54 players returning, over half the field was eliminated in the very first four levels of the day, with the tournament getting down to just three tables. Start-of-day chip leader Evan Lipshultz was still in contention having grown his stack from the start of the day, but the likes of Michael Gallagher, Justin Young, and Hien Nguyen would soon join him with seven-figure stacks. Former Main Event final tablist Jake Balsiger was a notable elimination in 14th place, taking home $9,155, with Denis Timofeev and Justin Young sitting on stacks of over two million at this point. 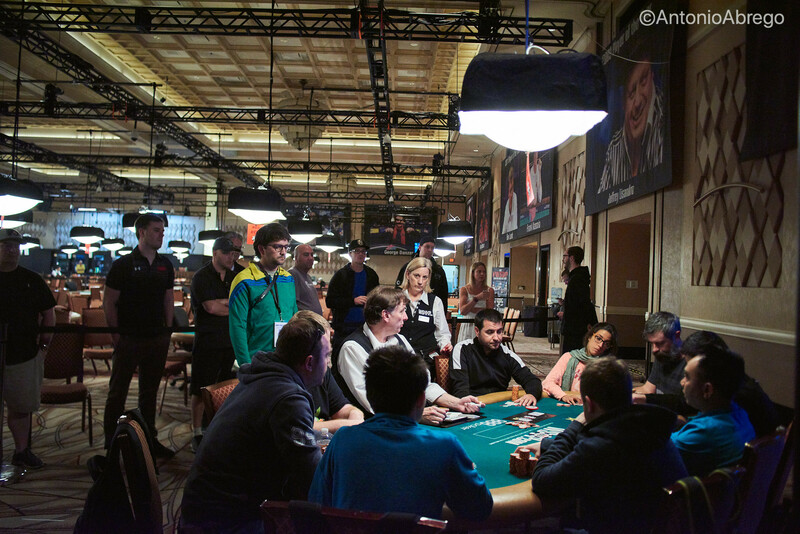 The action was fast-paced with an all-in almost every hand at the final two tables. So fast was the action that we went from 11 to nine in two hands at separate tables, with the eliminations of Eli Loewenthal and Michael Gallagher in 11th and 10th, respectively, with both players taking home $11,566. Timofeev and Lipshultz led the pack with nine remaining, with Leo Margets the table shortstack. However Justin Johnson was the first elimination, with Brazilian bracelet winner Thiago Nishijima close behind him, shoving a suited ace into the kings of Timofeev. Margets doubled through Hien Nguyen, with Nguyen busting shortly in seventh place, with Timofeev busting two players in a row. Young would add another elimination sending the other Spaniard Juan Carlos Martin to the rail in sixth, but Margets would double through Young leaving him short. He got his remaining chips in with ace-eight against the king-queen of Ben Yu. Young would flop a pair, but Yu turned a straight to eliminate Young in fifth place. The stacks were fairly level four-handed, and as the action slowed and the pace of play caught up with the blinds the average stack was around 30 big blinds compared to close to 20 at the start of play. Timofeev led, but Lipshultz would double through him to take over the lead. Timofeev would then double through Yu, and the two-time bracelet winner would bust in third place, his third deep run of this year. A short while later, start-of-day chip leader Lipshultz moved all in from the small blind and was called by Timofeev, sending Lipshultz to the rail in third. Margets doubled up a total of six times at the final table, including twice in succession heads-up against Timofeev to go from 2.3 million to 8.3 million, with just over 12 million chips in play. 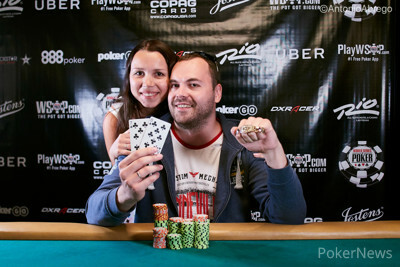 However, Timofeev would battle back and secure the vital double when he cracked the deuces of Margets with ace-seven. 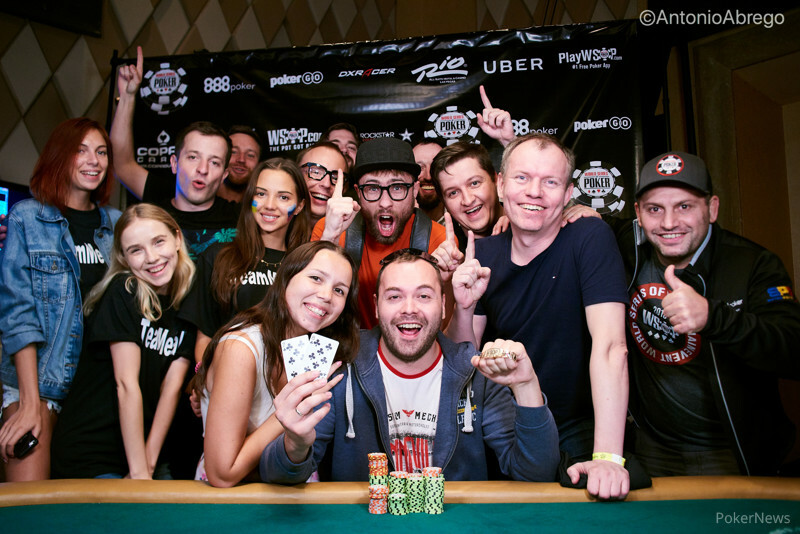 And just when Margets looked to grab another double to extend this already lengthy heads-up battle, Timofeev rivered a flush to secure the title, prize money, and his first WSOP gold bracelet.